Делегация из 50 участников "Коалиция в поддержку российского американского месяца истории", во главе с председателем доктором Ольгой Зацепиной, поехала в Олбани..
A delegation of the 50 member "Coalition in Support of Russian American History Month", lead by chairman Dr. Olga Zatsepina, traveled to Albany, capitol of New York State, on Tuesday March 5, 2013, to witness the submission of a Senate resolution of great importance to the Russian American community. Directing himself to the broad smiles and moist eyes of the delegation, Senator Adriano Espaillat, whose district includes a large number of Russian Americans, rose to deliver a warm and eloquent speech commending the Russian American community for its many accomplishments and significant contributions to his State and his Nation and offered the resolution for approval by the Senate. In a commendable spirit of bi-partisanship, Democrat Espaillat from Manhattan was joined as co-sponsor by Republican Majority Leader Dean G. Skelos, and Senators Golden and Bonacic, both of whom also co-sponsored the resolution last year, and Senator Simcha Felder of Brooklyn who joined the co-sponsors this year. Among the members of the coalition was the representative of the Russian Orthodox Church, Father Alexander, who was invited by the speaker to give the invocation and blessed the work of the Senate. 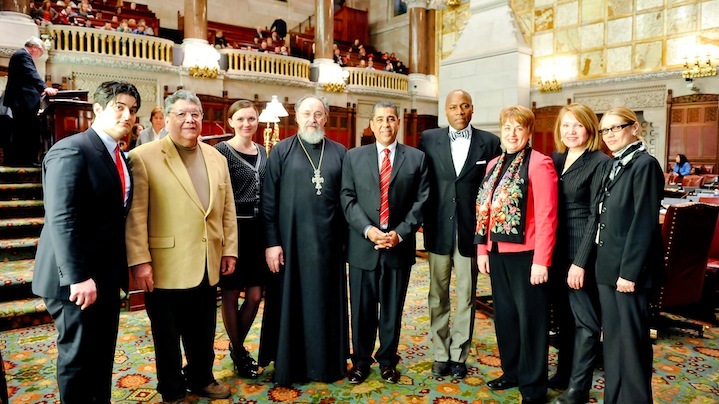 Before the meeting, the resolution sponsor, Senator Espaillat introduced the members of the coalition, presented the resolution, and explained what historical dates, significant for the history of Russian America, will be celebrated in April 2013.